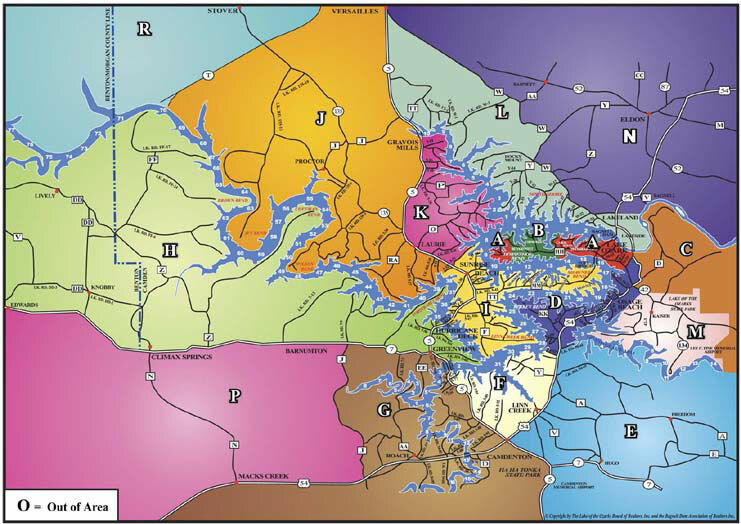 portions of the City of Lake Ozark. selecting Area “A” or Area “B”. of Brumley, Iberia, Ulman, Crocker, Dixon, St. Elizabeth and St. Anthony. located within Tan-Tar-A Estates whereas the “ownership” is Fee Simple. Estates, whereas the “ownership” is Leasehold (Leased Land). Eldridge, Branch, Buffalo, Tunas and Urbana. Niangua Arm and Osage Arm of the Lake of the Ozarks. of State Routes F, TT, and MM. Also includes Porto Cima and Villages. properties North of Versailles between Highway D and Highway 5. Gravois Arm and the Osage Arm of the Lake of the Ozarks. on the West by Highway 5 to Gravois Mills. Highway 5 North of Versailles. The cities of Eldon & Tuscumbia are in Area “N”. Hickory Hill, Eugene, Olean, Etterville, Mary’s Home, Henley and Brazito. surrounding area around Macks Creek. Also includes the city of Cross Timbers. T to the Osage Arm of the Lake of the Ozarks. The city of Stover is in Area “R”. Also includes the cities of Cole Camp, Florence, Warsaw and Lincoln.